Consumers may often wonder whether or not buying conventional or synthetic oil really makes a difference. Well, according to new AAA research, it does. 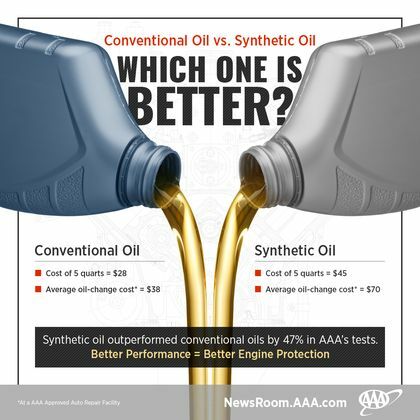 AAA found that synthetic oil outperformed conventional oil by an average of 47 percent in its independent evaluation, offering vehicles significantly better engine protection for only $5 more per month when following a factory-recommended oil change schedule. To protect vehicle engines, particularly those that operate in extreme conditions, AAA urges drivers to consider the benefits of switching to synthetic oil at their next oil change service. While only a limited number of vehicles specifically require synthetic oil, all vehicles can benefit from using it. Particularly, synthetic oil is beneficial to newer vehicles with turbo-charged engines, and vehicles that frequently drive in stop-and-go traffic, tow heavy loads, or operate in extreme hot or cold conditions. At an oil change service, many drivers are offered a choice between conventional or synthetic oil. However, in a companion AAA nationwide survey of U.S. drivers, 44 percent are either unsure (27 percent) or do not believe (17 percent) that the more expensive synthetic oil is better for a vehicle’s engine. Reasons cited for regularly choosing the cheaper, conventional oil include feeling that synthetic oil is too expensive, offers no benefit, that the upgrade to synthetic oil is an unnecessary up-sell by a repair facility, or they are simply not offered the choice. The hesitation to select synthetic oil may stem from American wariness of repair facilities, highlighted in another recent AAA survey which found that two-thirds of U.S. drivers do not trust them. Those looking for a trusted repair facility are urged to consider a AAA Approved Auto Repair Facility, which meets AAA’s high automotive care standards, including high levels of customer satisfaction. To locate a shop in your area, visit AAA.com/AutoRepair. The average cost of a conventional oil change is $38, while a synthetic oil change is $70. For those that change their vehicle’s oil themselves, the average cost of 5 quarts of conventional oil is approximately $28, while synthetic oil is $45. The vast majority (83 percent) of service professionals select synthetic oil for their personal vehicles. “The extra $30 per oil change could actually save money in the long run by reducing damage to your engine over time,” continued Tennant. AAA’s engine oil research focused on eight industry-standard ASTM (American Society for Testing and Materials) tests to evaluate the quality of both synthetic and conventional engine oils in terms of shear stability, deposit formation, volatility, cold-temperature pumpability, oxidation resistance and oxidation-induced rheological changes. At the time of testing, all tested oils were licensed by the American Petroleum Institute and advertised to meet the International Lubricants Standardization and Approval Committee’s GF-5 specifications. When selecting an oil, it is critical to reference the vehicle’s owner’s manual to ensure that the oil meets the exact specifications for that particular engine.